Like every responsible young man, willing to shoulder the liabilities of his family, Toufeeq Ahmad Kumar too had a goal to achieve. His father, Gulam Qadir Kumar baker by profession, was adamant on his son turning away from their ancestral occupation and pursue after well paying and respectable job in life. Toufeeq on passing his class 12th examination chose to specialize in a job oriented course instead of a conventional bachelor degree. But his financial conditions kept on posing a challenge to secure an admission in an institute where he could train himself in a job oriented course. One fine day, he got to know about DB Tech’s Himayat program. He was lucky enough to be a part of first batch of Hospitality trainees at DB Tech (Ganderbal). He was an efficient trainee, who from the very beginning impressed his trainers with his sense of inquisition. He left no opportunity to miss the chance to learn and acquire all the necessary skills taught in the centre. Everyone in the centre vouches for his brilliance. “I have never seen a trainee as studious and diligent as Toufeeq. His passion to learn and execute what he learned was remarkable”, says the Rukaya Fayaz (Centre Coordinator). One of his trainers Murtaza Shah remembers that he becomes a role model for others at the centre. “He actually showed us how to transform our life from better to much better,” says Murtaza. 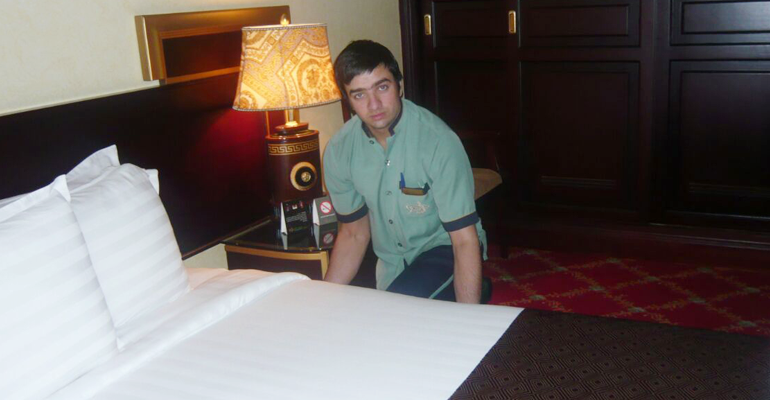 After completing his training at DB Tech, Toufeeq got his placement in the Hospitality section of Taj Vivanta, India’s topmost chain of hotels. During his three months at Taj Vivanta, his efficiency and hard work had left an infallible impression upon his bosses. From there he set out on another journey–a journey to work in the world’s most lucrative and extravagant Hotel. Toufeeq very skillfully secured a job in the Housekeeping section of the Middle East’s most well known Hotel AL Haram in Saudi Arabia. From last one and half years, he has been offering his services at Al- Haram. Today his life stands transformed; and he says that he owes it to DB Tech’s Himayat centre. Toufeeq himself acknowledges the role that Himayat played in his journey of success. “I had never imagined that I would be rubbing my shoulders with such a talented pool of people. All it was made possible by Himayat. I shall treasure the skills that I learnt at Himayat. Thank you Himayat!,” says jubilant Toufeeq. Toufeeq who at a point of time was unable to pay the fee of his school is now earning a handsome salary of Rs. 25000/- per month. DB Tech not only changed his life but also stood as saviour and protector of his family. Toufeeq’s success story is just another glaring example of the change, which Himayat is bringing to the lives of people through its much needed skill development programs.